French sports stars die in Argentina. 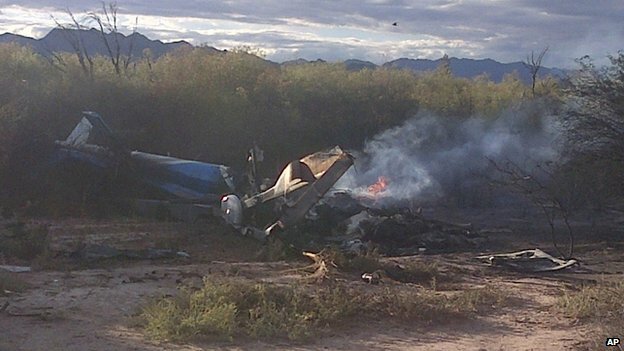 Three French sports personalities are among 10 people killed in a helicopter crash in Argentina, the French presidential office confirms. Eight French nationals and their two Argentine pilots died when two helicopters collided in La Rioja province in the country's north-west. Yachtswoman Florence Arthaud, Olympic swimmer Camille Muffat and Olympic boxer Alexis Vastine all died. The helicopters were involved in the filming of TV survival show Dropped. "The sudden death of our fellow French nationals is a cause of immense sadness," said a statement from French President Francois Hollande. Camille Muffat, 25, won three medals, including gold in the 400m freestyle in the 2012 London Olympics. She retired from competitive swimming in 2014. Alexis Vastine, 28, won bronze at the 2008 Beijing Olympics in the light-welterweight category. He was narrowly beaten in the quarter-finals of the 2012 Games. Florence Arthaud, 57, was a hugely accomplished sailor, winning the 1990 Route du Rhum, the prestigious solo Atlantic race. A serious car accident put her in a coma when she was 17. They crashed near Villa Castelli, about 1,170km (720 miles) from Buenos Aires, according to local officials. The helicopters were filming Dropped, a popular celebrity show on the channel TF1. The show flies celebrities into rough terrains by helicopter and films their attempts to find food and shelter. One of the contestants, former France and Arsenal footballer Sylvain Wiltord, tweeted: "I'm sad for my friends, I'm trembling, I'm horrified, I have no words, I don't want to say anything." Another cast member, figure skater Philippe Candeloro, was said to be "extremely shocked but unharmed". The cause of the crash is unclear. Officials have said the weather conditions in the mountainous area where the helicopters went down were good. "An explosion occurred and it's believed that they must have collided,'' said La Rioja Secretary of Security Cesar Angulo. "Aeronautical experts will have to determine that," he added. "We learn with great sadness about the accident during the filming of the Dropped show," said a statement issued by TF1. "All TF1 teams come together in this terrible time with the pain of the families and relatives of the victims." TF1 says the show will be postponed and the rest of the crew is returning home.